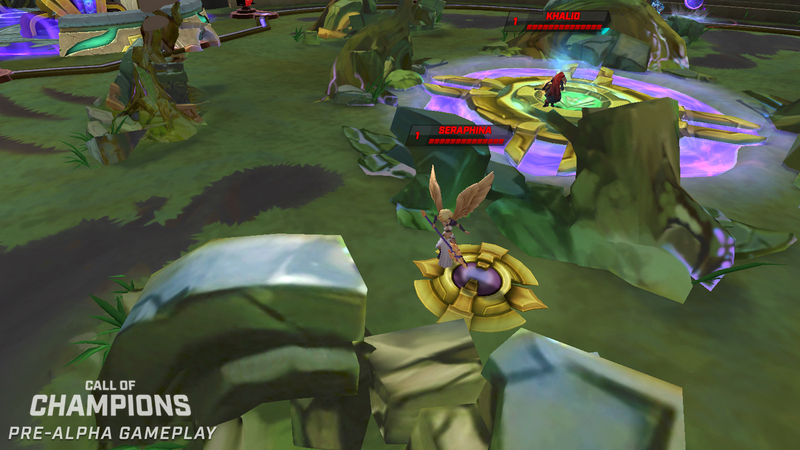 One of the games we were sworn to secrecy from telling you about at GDC 2015 last week was our hands-on time with Call of Champions, Spacetime Studios’ upcoming MOBA. 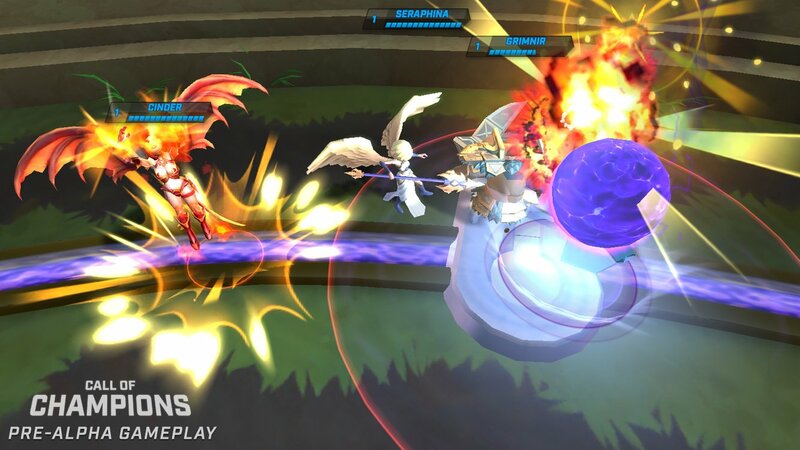 Whenever I hear about a MOBA coming to mobile, I always kind of fret a bit, because while I know that the genre can work as a fun game on mobile, as one that’s successful? I just always doubt it, because the games just don’t make a lot of money. MOBAs are such a tricky genre, too – they’re very complex games in terms of rules to where you can’t just change one little thing in order to make the game work – there’s a reason why most of these games have just one map. And since half-hour long mobile game sessions are untenable for most folks, there’s really no reason to believe that the genre could work. But what I saw of Call of Champions makes me believe that if any game has a shot at being not just fun, but also successful – it might as well be this game. Essentially, the game sessions are set to be five minutes long, with the win conditions being either to destroy the enemy base, capture more towers, or to get more kills if the tower count is tied when the five minute timer is up. The map has just two lanes, with the center containing powerups and a healing area. Each lane has a ball that can be pushed by standing near it, which goes faster if there’s more folks there to push it. When it’s at a tower, then the tower can be attacked, but of course it will attack the players going after it, so caution must be exercised. From the matches I got to see and play, base capturing will be rare, only a symptom of an outmatched team. But because towers and kills count so much in this 3-v-3 game, each one feels like a monumental achievement. There’s the elements of MOBA strategy, the pushing and the going for other lanes when necessary, the sacrifices in order to gain towers, but all in a super-fast game. I imagine enthusiasts will complain about the compromises, like no minions and nothing to buy during the matches, but what you have here is a game where the action starts almost instantaneously, and you get five minutes of high-intensity action to plow through. The game also seems super-accessible, because when you can spend just five minutes playing a match with a particular character type, it goes a long way toward feeling like, hey, maybe I can experiment instead of sticking with what I know because I have to put in such a huge time investment. Characters have permanent skill tweaks they can get, but there’s ideally no pay-to-win at all here, just faster unlocks, and there’s several dozen characters planned. That’s still really anathema to how mobile players spend, but this game is so accessible that maybe it can be done. And the tech behind the game is impressive. At one point, there were three of us playing a match together against presumably a team of bots, all 3 of us in the same area but communicating via a Clear 4G wi-fi hotspot, which is much slower than LTE, and in a busy hotel lobby. No issues whatsoever. Oh, and one of the devices was an Android tablet, with two iPads along as well, playing and interacting like it was no big deal. Spacetime’s cross-platform technology remains impressive. Oh, and if you drop out of a game for whatever reason, a bot will pick right up for you, and you can rejoin that game as soon as you get internet back. It’s impressive and solves one of the big problems of players dropping out on flaky wi-fi and cellular connections. The spectator mode, which was demoed in the hands-on video, was absurdly impressive in terms of its functionality, making it possible to watch a match from any angle. I don’t know if the eSports angle will take off with this game, but they’re ready for it. I’m definitely interested to see how fun this game is after a few hours, and with the actual online community that starts to show up as the game soft launches and goes global in the next few months. Will it be a success? I don’t know. But as a game that I want to play? I can’t wait to get my hands on this one again. If you’re around SXSW, try to play this one.